The first Boardman Fire Department was organized in 1923. This was a volunteer organization brought about by civic-minded men as they realized the need for such a firefighting unit after many unfortunate house fires. These men met in the boiler room of the old brick school house which is now part of Center Middle School. Even the fire chief, Merle Gifford, was a volunteer. Before any fire equipment was available, a bucket brigade had to be formed and water used from the old water trough as the men helplessly tried to put out a fire. The fire siren was placed on top of the station after the station was completed in 1927. At first, the fire department’s only equipment was a trailer to which two forty-gallon water tanks were attached. The trailer had to be pulled by a car which, at that time, meant that its top speed was probably 25 miles per hour. Once, Otter Elser was assigned to get the trailer. He reached the scene of the fire in 25 minutes even though the fire took place only four miles from the garage! Today, the response time for an alarm is from one to five minutes. In 1924, the department was able to purchase a Ford Model T truck, to which they attached the water tanks. This was kept in a one-car garage behind Merle Gifford’s first store, located on the southeast corner of Route 224 and Southern Boulevard, just east of the railroad tracks. There was a siren on a pole next to the garage. In 1927, the first real fire station was built. It was a small part of the present day station on Route 224. It was built partly though fundraising events held by the firemen, such as fish fries. The first fire truck of the Boardman Fire Department was built without a windshield. It had a water tank on it, and it was capable or pumping 500 gallons of water a minute. This was purchased in 1927. In 1929, with the Fire Department’s funds almost exhausted, the early leaders of the department decided to hold a play to raise badly needed money for essential firefighting supplies. The volunteer firemen decided to put on a play entitled Lend Me Your Wife. It was an amazing success, and the funds raised were used to provide additional fire equipment, a fire horn, and to help pay the construction cost of Boardman’s first fire station completed on August 17, 1927. Merle Gifford, who previously served as a volunteer, was the first full-time fireman in Boardman and the first to receive a salary for his work. According to Mr. Gifford, the department’s worst times were during World War II because of the lack of available manpower. The worst fire during his tenure as fire chief was the Hitchcock Barn Fire in 1928. The Hitchcock barn was one of Ohio’s largest stock barns. The fire completely destroyed it, as well as much livestock. As the township grew, the need for more fire protection arose. In 1937, a station was built on Market Street. It was later converted into our first police station. The station located at Shields Road and Lockwood Boulevard was added in 1959, and the one on South Avenue was built in 1961. Prior to the building of the fire station on South Avenue, one fire truck was kept in Good’s Garage near McKay’s Corners. As all areas were covered, the need for the Market Street station was eliminated, and the Route 224 station became the No.1 Station. In 1947, the highest honor Chief Gifford ever received was a personal invitation from President Truman to attend the Conference on Fire Protection. In 1955, full-time firemen were added to the fire department. In addition to putting out fires, they also acted as dispatchers and served on rescue squads. In 1962, Gifford resigned as fire chief, and Wayne Ewing took over. Don Cover became chief in 1965. Fire chiefs are selected mostly for their knowledge of fire service. As the job opens up, trustees choose the person they feel to be most qualified. 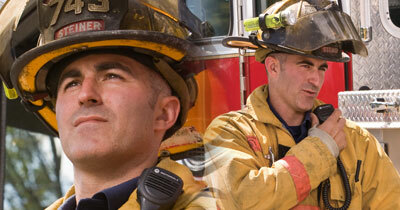 Firefighting knowledge and administrative service qualify him for the job (starting annual salary was $8,700). Cover had been in the department since 1943. During his tenure, he helped develop the department’s rescue facilities, which became known statewide. The department grew from 20 to 34 paid men. In 1966, it purchased the first elevated platform truck in Mahoning County. In 1969, a new central headquarters was built on Boardman-Poland Rd. When Mr. Cover first became fire chief in 1965, the department answered over 400 alarms a year. 1970 began with a fire loss of $52,000 suffered by J & J Gardens located at 5509 South Ave. The fire was out of control on arrival of the first truck but a quick response saved the company from total loss. Chief Cover’s recommendations for the future were to replace two outdated pumpers, and to add more manpower and an additional station to protect the southern part of the township. Due to the expanding township needs, the township hall and zoning office moved from the main fire station to 126 Boardman-Poland Rd. Chief Cover was grateful to the Township Trustees for improving the fire department by updating much-needed equipment and for hiring two new firefighters, James Dorman (the former Fire Chief) and Clark Jones (at that time Operations Manager of the Mahoning County Emergency Management Agency). In 1974 the reported fire loss of $862,285, consisting of a bowling alley and an office building, was the highest fire loss in Boardman’s history. In addition, Chief Cover reported to the trustees, the crime of arson was on the increase in all areas of the country and increased investigation has become a necessary part of the fire service. Working with the International Association of Arson Investigators and the insurance industry, the chief began an aggressive program to detect arson and stop payment of insurance when fraud was detected. In 1976, the remodeling of the main station was completed. Included in the remodeling were new offices, dorm, shower and toilet facilities and kitchen. Chief Cover reported in 1977 that new laws and regulations providing first aid service had generated problems for the department. A complete revision of Boardman’s first aid program needed to be initiated. The most significant change that affected the operation of the fire department was in 1978, the signing of the first labor contract and the initiation of Civil Service. 1980 began with the Fire Chief’s annual salary of $22,000. The Boardman Fire Department staff included 34 paid and 10 volunteer firefighters answering over 800 alarms a year. The passing of a Township levy in 1981 provided the means to repair the department’s trucks and bring back full service of the fire department. The primary focus in 1984 was several fires set in the Southern Park Mall and several automobile fires set along Market Street. Stake outs by the Fire Department along Market Street were started. With the cooperation of the mall security, store personnel and the Boardman Police Department, the suspect, who had a history of setting fires, was apprehended after he set a fire in a waste basket in one of the stores. Significant changes in 1986 included the retirement of Chief Cover and the implementation of a Township Fire Code which reflected improvement in operations of the Fire Prevention Bureau. Also in 1986, the Fire Department added its first secretary to the staff. In 1987 at an annual salary of $32,500, James E. Wilson was appointed the new Fire Chief. Included in Chief Wilson’s first annual report submitted to the Township Trustees was a page titled Projected Five-Year Plan. This year some of Chief Wilson’s long-range goals were to purchase at least two new pumper trucks, build a new station at the southeast or southwest corner of the township, purchase a new aerial truck, and add at least 10 new men by 1992. By 1995 the Boardman Fire Department had developed into a combination fire department consisting of 32 full-time firefighters and 13 part-time on-call personnel. 1996 brought about “the year of change.” Our department saw the retirement of Chief James E. Wilson after serving as Chief for eight years. In September, the department welcomed newly appointed Chief James R. Dorman at an annual salary of $46,508, an Assistant Chief, a new Captain and three new firefighters. The equipment updates included the purchase of a new pumper and new computers. Chief Dorman’s long-term goals included an additional pumper truck, additional manpower, a new station at the southern end of the township and AED’s in all fire department vehicles. In 1997 the fire loss rose to $3,116,691 — the second largest in the Boardman Fire Department’s history. The department witnessed a major arson fire, the formation of a Fire Investigation Team and a second Fire Prevention Officer. 1998 was just as active as the previous years. Boardman residents witnessed the complete destruction of the Maag Mansion located on Boardman-Poland Rd. due to fire. The following year the Township Trustees hired Tri-Data Consultants to study the Fire Department’s operations. Their recommendations provided our officials with “a blueprint for the future.” The fire loss for this year was the lowest it had been in 14 years ($328,640), although the numbers of responses made were at an all-time high of 2,899. The turn of the century began with 2,944 responses made by the Boardman Fire Department, a new all-time high. Juvenile arson saw an increase this year with 15 fires set by juveniles. To improve the chances of survival for cardiac arrest victims, the department purchased three Automatic External Defibrillators in the year 2000. Personnel remained constant with 33 paid firefighters and eight volunteer firefighters. Fire Chief James Dorman’s future goals remained the same — one additional fire station and an increase of manpower were his recommendations. In 2001, a year of tragedy, our departments as well as other Mahoning County fire departments saw the benefit of prior training in Terrorism Preparedness and training in dealing with issues of Weapons of Mass Destruction. Additionally in 2001 the Trustees took the first steps in renovating the aging fire department buildings. In 2002 the number of responses was 3,295; again higher than the previous years. Fifteen structure fires accounted for 86% of the fire loss of $753,260. The most significant fire damage was to the St. James Church, where a lighting strike to the steeple caused a fire loss of $250,000. The addition of three firefighters to the department’s roster enabled Chief Dorman for the first time to assign three firefighters to Stations 73 and 74 on a more consistent basis. In addition to hiring a part-time secretary to assist the Fire Prevention Office, the Boardman Police Department donated 41 portable radios to our department and a complete overhaul of our breathing air system took place. July and August of 2003 will always be remembered as “the year of the floods.” As well as responding to the otherwise “normal” emergency calls, the department had to forge through flood waters to rescue people trapped in their homes. Also, this year our Trustees received “a feel of the fire” and “a taste of the smoke” in a realistic training event that demostrated what it’s like to be a firefighter. Good news awaited our department in 2004. Our number of responses finally decreased this year. The remodeling project of Station 73 and the rebuilding of Station 74 were completed. The department also celebrated the arrival of our own Mobile Fire Safety Classroom. This was purchased with grant funds received from the Federal Emergency Management Agency. In 2011 Chief Dorman retired and the Trustees selected Chief George D. Brown to lead the department. Today our department has five apparatus in its fleet and 38 full-time firefighters. 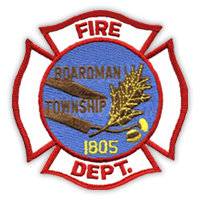 The Boardman Fire Department remains a dedicated team who put their lives on the line to prevent the loss of life and property and to provide quality emergency services to the citizens and visitors to Boardman Township.